Rocky Mountain Spray Foam, LLC is an owner-operated local business doing our part to reduce the nation�s dependence on foreign energy, improve the indoor air quality in our community, and provide the most professional insulation services in the area. We accomplish these goals by taking the time to understand your needs and ensuring that we only offer the highest quality product. We are an innovative insulation installer using the latest products and techniques to ensure superior energy performance. 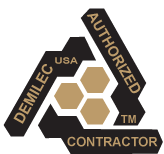 By researching independent studies and Government reports on energy and health issues related to our industry, we have chosen the safest, healthiest and highest performing insulation systems available today, which are from�DEMILEC (USA).